To solve sudoku one doesn't require the knowledge of mathematics but require the logic and reasoning. Solving Sudoku Puzzles daily helps with your brain. It improves the concentration and logical thinking. 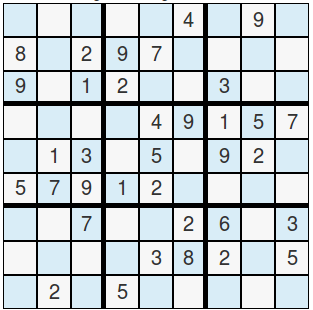 One can look for sudoku puzzles given in Newspapers or can play them online provided by many websites. 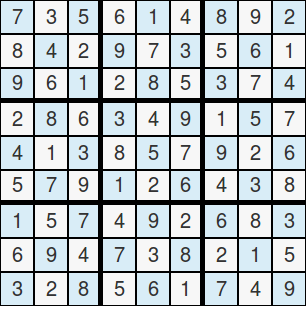 The goal is to just fill the empty cells with the already known numbers according to the Sudoku rules or exactly as given in your puzzle that you want to solve.You must give the correct input, i.e only numbers between 1 to 9 and use the number once and only once in each row, column and 3x3 grid section. See *Fig-1. Next, click on "Solve" button to get the answer instantly. Note, more than on solution may be possible. See *Fig-2. Fig-1: Enter known numbers in the cell.